Darla Miles reports on the joyful homecoming for the smallest baby ever born at Nassau University Medical Center. 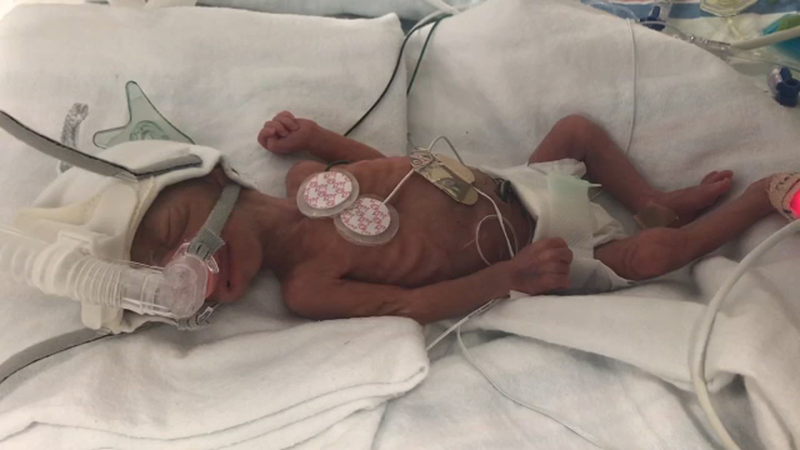 EAST MEADOW, Long Island -- The smallest baby ever born at Nassau University Medical Center, weighing in at just 1 pound, 4 ounces, has finally gone home. Hannah Bella Rodriguez, dubbed the "Miracle Baby," was introduced Monday by Nassau County Executive Laura Curran and hospital staff members who helped care for her after she was born on July 11. She was officially discharged in a special ceremony at 11 a.m. and now weighs 5 pounds, 5 ounces. Rodriguez was born 13 weeks premature, and at the time mom Jennifer Pena de Mena received an emergency C-section, she was the size of an average adult's hand. "There's many patients around the gestational age that don't make it," NUMC Dr. John Riggs said. " They don't survive, or have some serious problems." Pena de Mena wasn't due until October, but she was admitted to the hospital in June with pregnancy complications. When Hannah's heart rate started to decline, doctors decided to deliver the baby early, in July. "I was so scared, but they helped me a lot," she said. "I was crying in the surgery room, but they hold my hands and they told me everything is for your baby." The little girl, one of 450,000 children who are born premature in America each year, was able to grow and stabilize. Pena de Mena thanked the doctors and nurses. "I never lost my faith," she said. "She's always going to be my beautiful baby, and I love her." She said her little girl is continuing to attend premature baby appointments. "I know everything is going to be OK," she said.